Here are the top 500 returning 100m dash returners. 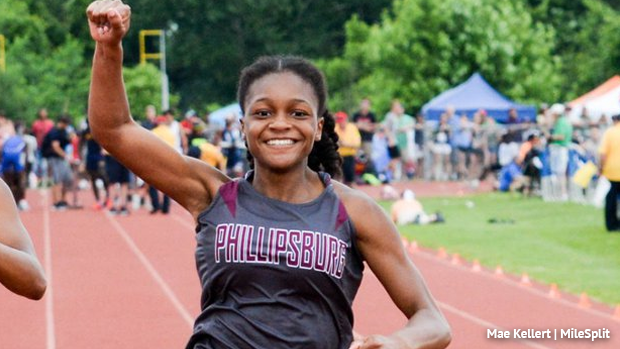 She may have missed out on most of this indoor season due to injury but if you didn't see our interview with Sydney Hawkins, the defending Meet of Champions winner, she IS BACK. And she feels healthy and ready to roll for a new track season. She leads all of NJ into 2019 with her 11.73 from MOCs. You know what else is awesome? There are six returners from the eight girls in last year's final! Dennisha Page was second, she is third on this list at 11.90 and Lauren Princz was third as a freshman, she's second on this list at 11.81. Princz is also the defending MOCs champ in the 200m. If you were following the indoor season, another outdoor 100m final returner, Jailya Ash of Eastern Regional won the indoor Meet of Champions 55m dash with a major PR of 7.06. She dropped .18 from the previous winter and is #9 on this list. Also returning from last year's Meet of Champions final are two Paul VI seniors, Aaliyah Vandergrift and Keyanna'a Watkins. So many girls to keep an eye out for this spring, here are the final 55m dash rankings from indoor as well.